<<Gliese 710 is an orange dwarf star (K7 spectral class) in the constellation Serpens Cauda, with visual magnitude 9.66 and a mass of 0.4–0.6 solar masses. It is about 63.0 light years from Earth, but is notable because its proper motion, distance, and radial velocity indicate that it will approach within 1.1 light years (70,000 AU) from Earth within 1.4 million years, based on the latest Hipparcos data. At closest approach it will be a first-magnitude star about as bright as Antares. The proper motion of this star is very small for its distance, meaning it is traveling nearly directly in our line of sight; compare for example with Arcturus. In a time interval of ±10 million years from the present, Gliese 710 is the star whose combination of mass and close approach distance will cause the greatest gravitational perturbation of our solar system. Specifically, it has the potential to perturb the Oort cloud enough to send a shower of comets into the inner solar system, possibly causing an impact event. However, recent dynamic models by García-Sánchez, et al. indicate that the net increase in cratering rate due to the passage of Gliese 710 will be no more than 5%. They estimate that the closest approach will happen in 1,360,000 years when the star will approach within 0.337 ± 0.177 pc (1.1 ly) of the Sun. oh yeah. too bad I cant catch each and every post. <<Gliese 710 or HIP 89825 is a orange 0.6 M☉ star in the constellation Serpens Cauda whose main popular interest is its future significant close encounter with the Sun. According to Filip Berski and Piotr Dybczyński, this event will be "the strongest disrupting encounter in the future and history of the solar system". Earlier dynamic models indicated that the net increase in cratering rate due to the passage of Gliese 710 would be no more than 5%. They had originally estimated that the closest approach would happen in 1,360,000 years when the star will approach within 0.337 ± 0.177 parsecs of the Sun. Gaia DR2 now finds the minimum perihelion distance is 0.0676±0.0157 parsecs or 13900±3200 AU about 1.281 million years from now: being about 20 times closer than the current distance of Proxima Centauri. It will then reach a similar brightness to the brightest planets, perhaps reaching an apparent visual magnitude of about −2.7 (brighter than Mars at opposition). Maximum total proper motion will peak around one arc minute per year, whose apparent motion will be readily noticeable over a human lifespan. 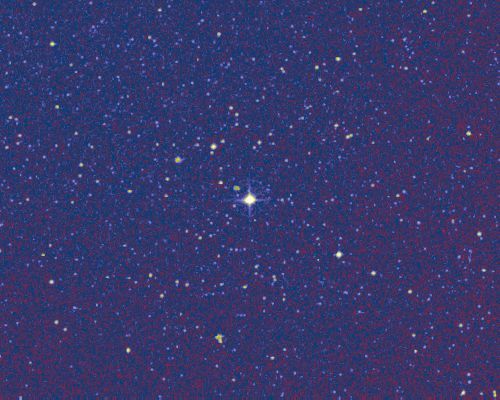 Gliese 710 currently is 63.8 light-years (19.6 parsecs) from Earth in the constellation Serpens and has a below naked-eye visual magnitude of 9.69. Stellar classification of K7 Vk, which means it is a small main sequence star mostly generating energy through the thermonuclear fusion of hydrogen at its core. (The suffix 'k' indicates that the spectrum shows absorption lines from interstellar matter.) Stellar mass is about 60% of the Sun's mass with an estimated 67% of the Sun's radius. It is suspected to be a variable star that may vary in magnitude from 9.65–9.69. As of 2017, no planets have been detected orbiting this star. I am determined to ride this one out. In a time interval of ±10 million years from the present, Gliese 710 is the star whose combination of mass and close approach distance will cause the greatest gravitational perturbation of our solar system. So it may already have happened 10 million years ago? Why didn't anyone wake me up when it happened? Well... you just looked so peaceful. https://en.wikipedia.org/wiki/Gliese_710 wrote: <<Gliese 710 or HIP 89825 is a orange 0.6 M☉ star in the constellation Serpens Cauda whose main popular interest is its future significant close encounter with the Sun. According to Filip Berski and Piotr Dybczyński, this event will be "the strongest disrupting encounter in the future and history of the solar system". Earlier dynamic models indicated that the net increase in cratering rate due to the passage of Gliese 710 would be no more than 5%. They had originally estimated that the closest approach would happen in 1,360,000 years when the star will approach within 0.337 ± 0.177 parsecs of the Sun. Gaia DR2 now finds the minimum perihelion distance is 0.0676±0.0157 parsecs or 13900±3200 AU about 1.281 million years from now: being about 20 times closer than the current distance of Proxima Centauri. It will then reach a similar brightness to the brightest planets, perhaps reaching an apparent visual magnitude of about −2.7 (brighter than Mars at opposition). Maximum total proper motion will peak around one arc minute per year, whose apparent motion will be readily noticeable over a human lifespan. Martha Stuart wrote: It's a good thing! I, personally, would feel a lot safer if we had one of those Space Forces. I'll make a note of the date in my iPhone, with a reminder set to alert me at, say, 10,000 years in advance. By then I ought to co-exist with the device, so I'll be sure to get the wake-up call.